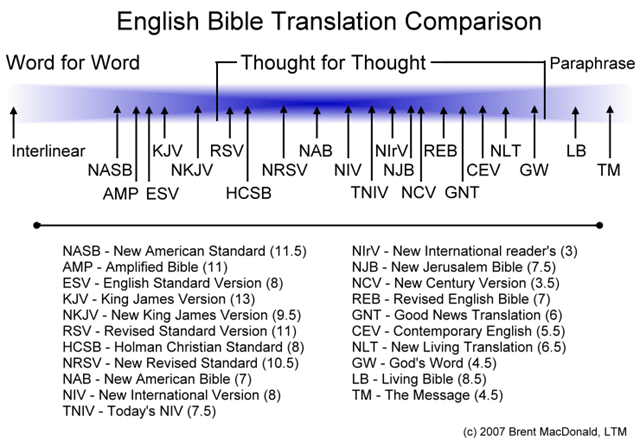 I ran across this Bible translation chart. I found it helpful in visually explaining the goal of different English translations. The number in parenthesis is the grade level readability. The chart comes from Lion Track Ministries. I can’t speak to it’s accuracy. I don't think I'd put the AMP in such a good position on the Word for Word side of the chart.That translation can at times be more like a "choose your own adventure" version; where people can choose a favoured word/phrase option to suit a meaning closest to their own doctrine.It's a useful tool, but not one I would recommend without additional reference to other translations.It's translation of John 3:16 in particular ADDS to the actual text and changes its contextual meaning. "Choose your own adventure" – great analogy. :) I see your point on how that could be abused. The Amp makes for a nice study tool, but is a real pain for regular reading. I use the ESV most of the time but read some from the NIV and the NKJV. I am thinking of going KJV only. Interesting. I started decades ago in the KJV, then went to NIV because that’s what my church used, but eventually used the NKJV for the more literal translation but without the “thee’s and thou’s” that bothered everyone else. I used the NASB for a while because of the greater formal equivalency. A little while ago I started checking out the ESV, which I like for formal equivalence plus readability. But now I read and study mostly KJV with ESV, NASB and NKJV for additional study. It’s kinda funny how many folks I know have come full circle back to KJV for their main Bible. I am by no means a KJV-Only guy, but I do look to it the most. Believe it or not while a member of a reformed baptist church one of the men shared as a "great concern" that his nephew was considering buying the TNIV. Kevin,It would be funny if it weren't for the fact that at the time I shared his opinion. Oh well, God is good and I am oft the fool. Hi Tim, It sounds pretty useful. I have wanted to get a chronological type Bible, maybe I'll add it to my wish list.——— Kevin,my bible keeps all of the books intact. Some chronological bibles are a cut and paste job in which the editor determines where a particular part of the bible fits in a chronological history.I also have one of the latter type but never use it.If God saw fit to give us scripture in books, then I'm not too keen on tampering with that choice.Putting the whole books in a more suitable chronological order is another issue. I find that reading the books more or less in the order of writing gives a more coherent perspective.And its surprising how much of a difference the absence of chapter and verse numbers makes. Hi Tim, I can see how the absence of the chapters would be particularly helpful in the case of Romans 9-11. Calvinists often take 9 in isolation, but it's pretty clear that the three chapters go together as one thought. Very informative site with lots of great resources! Thank you very much, keep up the good work.